Written on March 10, 2010 by Kevin. On this day 5 years ago... I posted and commented on our first ultrasound for Rylan. It has been a long time now posting near daily on this blog. A total of 939 blog posts. As recent months have shown, it has become more and more difficult to find words to continue at full steam. The parent blogosphere has increased a million times over and this once popular daddy blog has been looked over, which is fine. We have all benefited from this website as companies have been generous enough to allow us to review products and giveaway more. The kids have earned money into their savings account by the minimal advertising that I show. Visitors have learned things about our family, parenting, food allergies and quite possibly the most important thing, how to get rid of soap suds in the dishwasher. I have changed the look of the website many of times and realized after the last change that my wife is best at choosing the colors. I will continue to post the occasional family photo and rather than try to think about what to write about the following day, I will focus on what we are doing and enjoy it without distraction. If you are in fact family and would like to continue hearing about what is going on in our life, please find us on Facebook. For the rest of the visitors, I encourage you to look around in the five years of archives. There is a lot of information to scour through. Some interesting and others not. I know that we will certainly reference back to the archive at times in hope of recouping those foggy memories. Written on March 2, 2010 by Kevin. While everyone else has been watching the Olympics, we have been sampling the new Pampers Cruisers with Dry Max. As I previously mentioned, Pampers provided some of the Olympic athletes families with these same diapers. We received our sample pack of them last week and immediately put one on Kaitlyn. First impression is good. They are so thin that it makes you wonder just how well they are going to work. Kaitlyn enjoyed putting her pants on afterwards and we noticed that you no longer experience the diaper bulge that is typical while wearing diapers. She was able to move around easily with them and she seemed to like them a lot. As the pack was being used we experienced one minor leak. These diapers do start out as the thinnest diapers I have seen but as wetness is introduced, they blimp up. They blimp up like crazy. I cannot be certain but I am pretty sure that Kaitlyn is not drinking any more water than normal which would cause these diapers to swell up as they do. Moisture or not, these diapers did not cause any diaper rash so that was definitely a good thing. All in all, I would suggest these diapers for any type of travel. These diapers are easily equal to two Pampers diapers to the thickness of 1 normal diaper. I imagine they would be appreciated in a diaper bag. 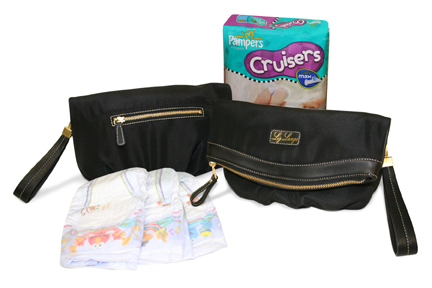 Speaking of diaper bag, today I am opening a giveaway for a pack of these Pampers Cruisers with Dry Max and a Liz Lange Diaper Clutch. This giveaway is open until 11:59pm PST on March 9th. To enter, just leave a comment. UPDATE: The contest has been completed. Our random winner is comment #20, Fredrick. Please contact me with your mailing address so that I can have this sent to you.